Location: West end of Plum Island. Description: 34 feet, Fourth Order Fresnel lens made by "Barbier and Bernard, Constructeurs, Paris, 1897;" Original light had rough stone construction, Current light (1869) has granite construction. 1826, August 28: The local Superintendent of Lighthouses issues a call for proposals to build a "Light-House and Dwelling-House on the west end of Plumb-Island." The tower is to be a 30 foot octagonal structure with an iron lantern containing "patent lamps and reflectors, ten butts for keeping the oil, and all the necessary apparatus, to the same manner as the Light-Houses in the United States have been fitted up by Winslow Lewis." 1869: Rebuilt in same style as Old Field and Block Island North lights. 1997: The generator house falls in to the sea as the result of erosion and government neglect. 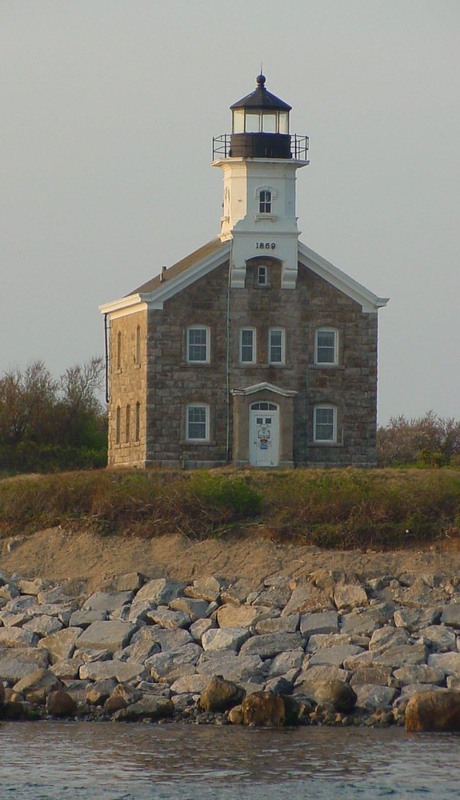 2000: The Long Island Chapter of the US Lighthouse Society begins a push to save the lighthouse, and procures rocks for the stabilization of the eroding bluff beneath the lighthouse. 2004, November: The Long Island Chapter of the U.S. Lighthouse Society arranged and funds an architectural assessment of the lighthouse. The surrounding area: Plum Island is the U.S. Department of Homeland Security's Animal Disease Center and is a restricted area. Similar Lights: The Old Field Point and Block Island North lights are of the same design. Other information: The Fourth Order Fresnel lens is on loan to the East End Seaport and Marine Foundation and is one display at their museum. Who to Contact: Long Island Chapter of the U.S. Lighthouse Society; 631-207-4331. Plum Island Lighthouse on June 6, 1999. Plum Island Lighthouse in May 2005. Note the rocks placed on the bluff to stabilize it. 2006 Long Island Lighthouse Challenge Note: This light will be part of the challenge. It can be seen from Orient Point.